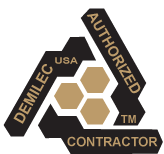 Spray foam insulations from DEMILEC (USA) are environmentally-safe, non-toxic and completely air-seal residential and commercial buildings such as homes, schools, offices and more. Combined with a proper air management system, these products are the answer to improved indoor air quality, energy efficiency and sound abatement. By sealing out dust, allergens, odors and pollutants, these products allow the air management system to be designed so that the indoor air quality is healthier than the outside air. The air-seal results in increased energy efficiency (as much as 50%), which translates into short- and long-term savings such as the use of a properly sized HVAC unit; elimination of building wrap, less use of natural resources and lower utility bills. Noise pollution is reduced because airborne noise can no longer seep through walls. Areas where the difference will quickly be appreciated include offices, classrooms, master bedrooms, laundry rooms, media rooms and plumbing runs. Shouldn't your building be safe, healthy, energy efficient and quiet? Contact us today.